I’m happy to start of course with the sweet Beverley of Pack your Passport! 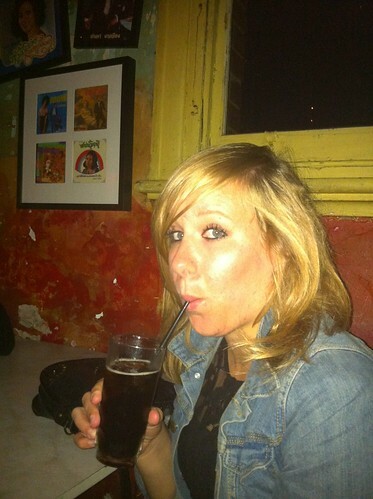 Her travels began when she took her first plane ride to Australia in 2010! We met through #TTOT and exchanged a lot of travel answers and since then I’ve followed her stories as an expat in Australia. 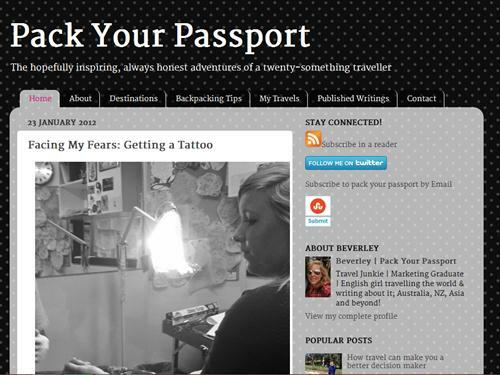 Here’s my chat with Beverley of Pack your Passport. Where are you from? I’m from a very small town called Stamford in England. No-one knows where it is…..I probably wouldn’t recommend going there……! I’m a 20-something travel junkie and marketing graduate travelling the world and writing about it! I’m travelling with my boyfriend and we’ve been in Australia for 18 months but we’ll also be heading to New Zealand and Asia too in the next 6 – 18 months. Why did you decide to start a travel blog? I started my travel blog out of a genuine love for both writing and travel – it’s my little outlet for all the ups and downs of my travels so far but I also hope that it inspires others to travel too. What’s the most challenging part of being a travel blogger? The most challenging part is finding the time to publish new posts when you’re actually travelling! Writing the posts isn’t the problem (I use the Notes app on my iPhone to draft out posts wherever I am!) but actually getting them out there is the problem! Can you tell us about your first travel experience? I didn’t properly experience what it felt like to travel properly (ie. 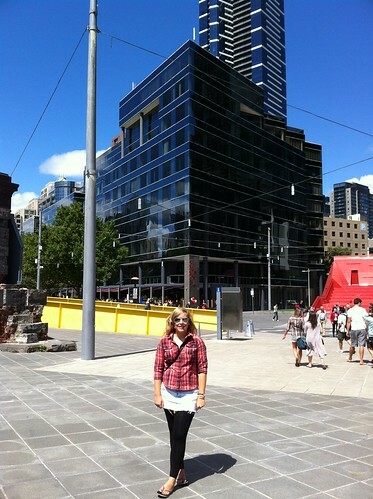 not a holiday with the parents) until I came to Australia in June 2010. It was a big step into the unknown, having never flown or travelled further than France before, but I honestly believe that it’s the best decision I ever made. Well I still have so much more of the world to see, but so far my favourite destination is Sydney purely because, as the first destination I arrived in, it will always be a special place to me. If you can travel with a real or fictional character, who will you travel with and why? Can I be really geeky and say that I’d like to travel with Dallas Green (google it!) so that I could constantly listen to his music LIVE! What’s your favourite travel quote (from a book, film, TV show etc)? I visited a cafe in Kings Cross (Sydney) once and on the wall was a quote by Henry David Thoreau: “Go confidently in the direction of your dreams! Live the life you’ve imagined” and that really spoke to me. If you have one flight ticket to go anywhere in the world tomorrow, where will you go? What is the strangest thing you have eaten, drank or experienced on your travels? The strangest thing I’ve eaten on my travels so far was octopus which, just in case you’re wondering, takes like one of those rubber bath mats with the suckers on the bottom: gross! Strangest thing I’ve experienced? A man clipping his toe nails on the tram in Melbourne: disgusting! I’m still a newbie travel blogger myself but my one piece of advice would be to be yourself! Do you want to be interviewed on our next session of Talk with a Travel Newcomer? The only requirement of course is that you have to be a newbie travel blogger. Contact me if you’d like to be featured! Great interview…hope to read more posts from you. As well as Thoreau goes he always delivers great travel inspiration. Just the other day here in Spain I visited en exhibition which featured a replica of his wood-cabin near Walden pond. Cool interview! I have no idea where Stamford is – despite being a Brit myself but will look out for it next time I’m home. 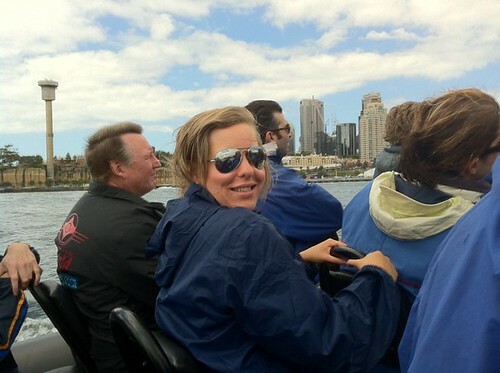 Totally agree with Beverley that it’s hard to find the time to post as a travel blogger. Beverley, you should prepare yourself for A LOT more public toe nail clipping in Asia! And Asian guys seem to think it’s perfectly acceptable to pop spots using their Moped wing mirrors as a guide! Not the nicest thing to see!